What Weather Can You Expect in Argentina? Argentina is one big, long country and as you might expect, the weather changes markedly from north to south, so you can find everything from steamy rainforest climates to arid deserts. 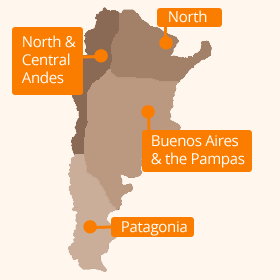 Very roughly, you can divide Argentina into four sections: a long strip which follows the Andes down the western side of the country, and the rest into roughly equal thirds. The 'long strip' is fairly arid, particularly in the north-west around Salta and in the south around El Calafate, although central areas such as Mendoza and Bariloche see a fair amount of rain and snow in the winter. For the rest of the country, starting at the top: you have the humid, sub-tropical north-east around Iguazu Falls, a more temperate area from roughly Buenos Aires southwards, and then the chillier and wetter southern tip, from around Rio Gallegos down into Tierra del Fuego. Weather in Buenos Aires is almost always pleasant, with the temperature rarely dropping below 6-7°C in winter (Jun-Aug), and topping out at around 30°C in summer (Dec-Feb). Like most big cities, it may feel a little hot and sticky in summer, but you can always head down to the Rio Plata in search of a breeze... You'll see the most rain in spring and autumn, but even then you rarely get more than 1 day in 3 with any rain. Argentina's wine country has a largely Mediterranean climate, becoming more arid up in the north-west as you get into the area around Salta. Temperatures can depend on altitude but are pleasant year-round, so the main thing is to avoid the rains which come in their summer (Nov-Mar), although these rains also become lighter further south around Mendoza. The area known as 'Mesopotamia' because it lies between two mighty rivers (the Rio Uruguay and the Rio Parana) is the only part of Argentina which is semi-tropical. At places like Iguazu Falls you'll see tropical showers throughout the year, while it's hottest and most humid from November through to April. Because of the high water flows at this time of year, this is generally felt to be the best time to visit Iguazu Falls.